Foolin' Around is the eastern of the three upper West Forks of Butler Canyon, in North Wash (aka East Fork of West Butler). It is a fun, enjoyable canyon with just a hint of the “problems” found next door, in Shenanigans. A nice canyon in a wilderness setting, "FA" has a pleasant, casual rhythm to it, moving in and out of interesting narrows and rappels, that makes it a good choice for a low-stress day. The only water (usually) is in the last narrows, which also involves the highest, hardest climbing problems. This section can be walked around (with a bit of scrambling to get back down) if the desire to stay dry and warm is stronger than the desire to experience the best part of the canyon. Other sections in the canyon include a bit of strenuous squeezing, but nothing too narrow. Several exit choices are available. The easiest exit climbs slabs west at the top of the last rappel, gains the ridge between Foolin’ and Shenanigans and returns to the car in perhaps an hour. Or, after completing the last rap, hiking downcanyon leads to the “Kelsey Exit” (back up to the “Four-way junction”); or follow the canyon all the way down to Three-Forks on Highway 95. Drybags for your gear. Wetsuits needed for the final section in all but the hottest weather. This is a natural-anchor area; bring webbing and rapid links. Foolin’ Around is the eastern of the three west forks of the Butler Canyon complex. It is not named on the USGS maps, but is the canyon running south-southwest from near point 5254T on the Stair Canyon quadrangle. The canyon is east of point 5143T. Exit from Foolin’ Around can be made by: 1) Avoiding the last rappel and climbing to the ridge west of FA and hiking back to the starting point; 2) Climbing out the "Kelsey Exit", a steep, loose chimney with a few climbing moves that pops out on the rim a half-mile from "The Four-Way"; or 3) Walking down Butler Canyon to Highway 95 at Three Forks. The walk out is 3.5 miles, pleasant but unspectacular. Three Forks is 4.9 miles down Highway 95 from the Bullfrog Road. You may wish to spot a car there. Decide what options you wish to leave yourself, and spot cars accordingly. From the intersection of the Bullfrog Road (UT-276) with Highway 95 in North Wash, drive north .6 miles on Hwy 95. Turn right (east) on a small dirt road, suitable for 2WD vehicles in dry conditions, and proceed 3.9 miles to an intersection and clump of trees, known as "The Four-Way". Spot a car here if planning on the Kelsey exit. Continue 1.5 miles northeast on the main road and park where a seismic survey road crosses the main road. Follow the seismic road east. If you ever wonder what the term “cowed up” means, you can discover it here. Cross the first drainage (Monkey Business) in about 10 minutes, and continue on the road to the second drainage (about 20 minutes) with several sub-branches. Continue on the road to the third drainage, about 30 minutes from the car. Follow the drainage south (right) to the first, short drop. Follow the rim on the left (east) downcanyon, 100 feet to a downclimbable slope that leads down one level. 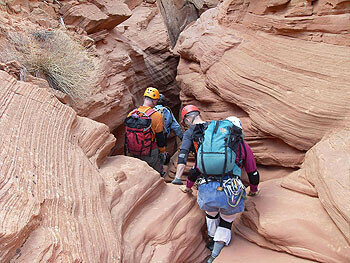 Continue following the rim downcanyon to a twisting in the canyon floor that allows easy descent to the drainage. Part One. The canyon has short narrows sections interspersed with easy walking. About 20 minutes in is the first serious obstacle, a 20’ rappel anchored off rocks in the streambed, that some will choose to downclimb. Again, small slots and downclimbs, and a few short, fun challenges intersperse with more open walking. About 40 minutes from the start, a cross-joint allows easy escape to either side. About one hour into the canyon, a chockstone creates a drop, and an extremely awkward 25 foot rappel into a narrow slot below. The canyon continues with discontinuous narrows. Half an hour past the awkward chockstone rap, the canyon opens wide with a sandy wash-bottom. A canyon comes in on the left – this is “Playin’ Around”, a short, fun downclimbing slot with a bit of high stemming and a bit of a tight squeeze to it. (Follow slickrock up on the left side and work over into the canyon. The final narrow section is really cool, but requires a bit of off-the-ground work and a bit of squeezing). The Swirly and The Big Drop Soon, a narrow slot develops in the canyon floor. While easily walked around, this slot is great fun and very pretty - get down there and follow it! Which leads to the top of a big drop. (The slot is easily exited here, either side). The drop has numerous small potholes, and looks like it might have difficult pothole escapes, but the eye is deceived! This drop can be walked/downclimbed around on the left, or can be rapped directly (65 feet); bouncing over MOST of the potholes with little difficulty. You will most likely end up IN the pothole at the bottom. For an anchor, a deadman can be constructed in the first pothole down, which has advantageous geometry. 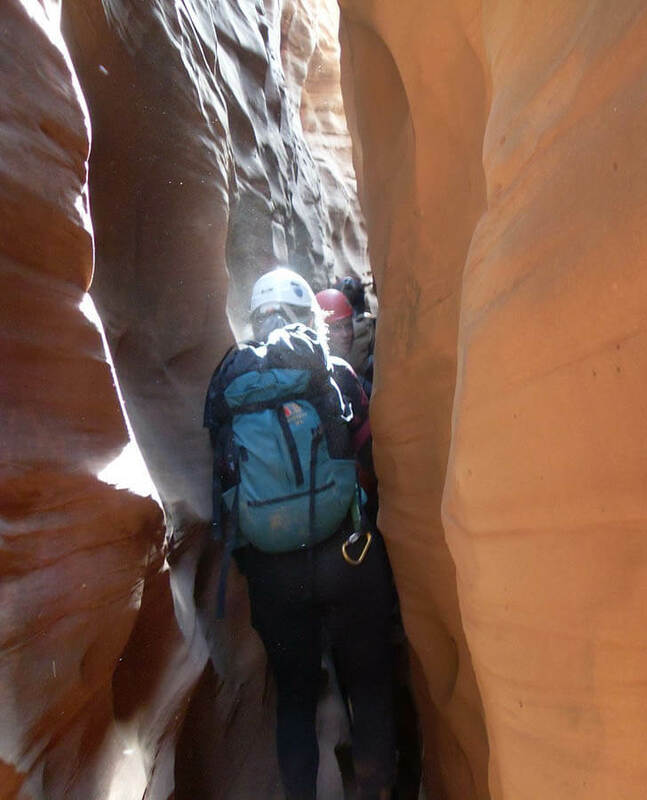 (A handline might be necessary to get into this pothole – subsequent canyoneers can be assisted from below). A sufficiently large and sturdy rock may need to be found and brought down to the pothole for the base of the deadman anchor. The short narrows/open walking theme resumes, but with each narrows getting a little more intense. Twenty minutes past The Big Drop, a long, narrow section creates annoyance by leaning sharply to one side. Survive this and a short open area appears on the left, before the narrow slot resumes. Part Four. The final section involves narrow stemming and a bit of swimming. The pool is not spring-fed, but holds water exceptionally well – and a swim should be expected even in the driest of conditions. Suit up and drybag gear at the open area after the slanted corridor. (Those wishing to avoid the swim may climb up the slickrock to the east, then track the canyon southwest 1000 feet and find a route down into the next larger open area. Getting down the last 20 feet to the canyon floor can be challenging. Re-enter the canyon. One hundred feet downcanyon, it narrows up and the floor drops out. Stay at the same level and climb from chockstone to chockstone around a turn. Pick a place to worm down to the canyon floor – but not too early, there are some tight spots down there! Best to send the smallest person first. Follow the canyon as it progresses from being a little wet, to ankle deep, to waist deep to a full swim! In dry conditions, the full swim will be just a few yards; in wet conditions it can be as much as 100 feet. Run out of the slot and find a place in the sun to warm up! The Business: Final Rappel – or Not! The large open slickrock area is a great place to warm up, if the wind is not blowing. 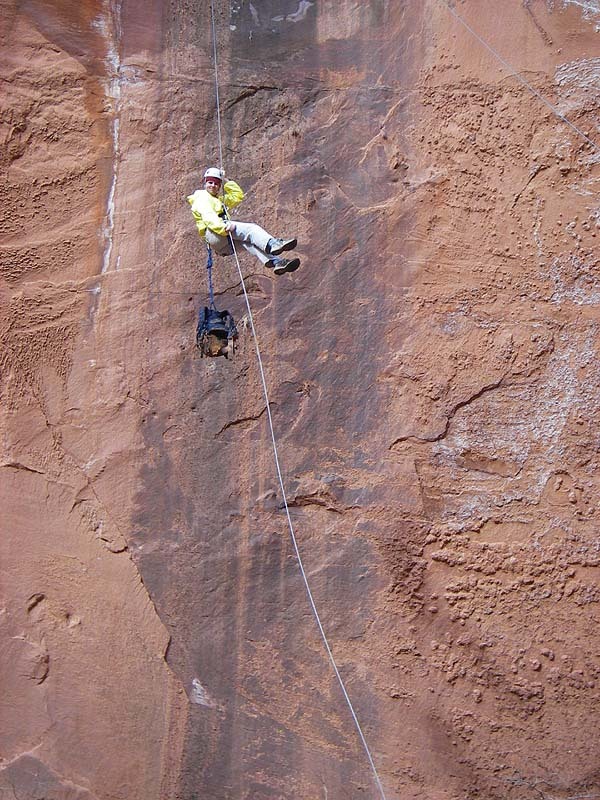 The 100 foot final rappel is at the edge of the slickrock. A long sling around a large flake provides an anchor. For those wishing to forego the final rap and return to the starting point, climb the steepish gully to the right (LDC, northwest). A bit of slab climbing near the top is the hardest climbing on the exit. Work your way up the domes and slabs and enjoy expansive views on your hike back to the start. Rappel. Hike down the pretty, rugged canyon. The main West Fork comes in from the right 30 minutes downstream, and the canyon becomes wider and more open. Another 1/5-mile downcanyon, a pair of joint-canyons cross the canyon. The canyon/gully on the right (west) is the Kelsey Exit, and is marked by looking unlikely in the lower section and impossible at the top. Hike up into the side canyon/slot and climb up it. Several spots will require careful climbing through remarkably rotten rock. The middle section includes ascending up piles of loose boulders - wearing helmets and managing the group well for this exit are good ideas. Two-thirds of the way up, two exposed step-ups provide access to slabs and ledges leading right (north) to marvelous slickrock bowls. Traverse the bowls and climb to the rim. Hike north-northwest to "The Four-Way". Especially energetic people can hike west from the top of the Kelsey Exit, and drop down the East Fork of Leprechaun. Interested in a nice hike to get out of there? This is my choice when it is dark, raining, or I just don't feel like making the steep climb up to the rim. Continue downcanyon 3.5 miles to Three Forks, where Butler and Stair canyons feed into North Wash.
(as shown - follow left shoulder then downclimb to bench level, then walk bench to place to easily descend slope into canyon bottom).